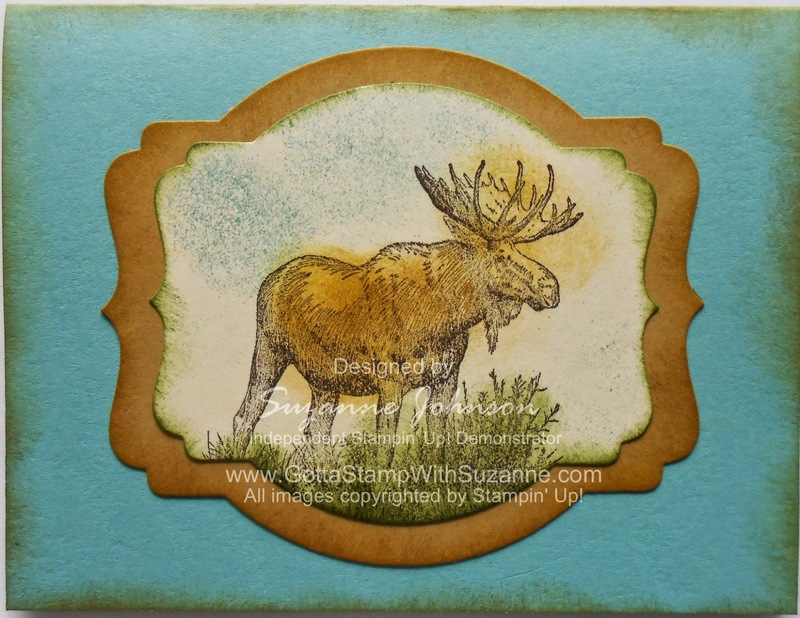 GOTTA STAMP WITH SUZANNE JOHNSON: HERE'S LOOKING AT MOOSE, KID! HERE'S LOOKING AT MOOSE, KID! Stamps with realistic animal images always make the top of my wish list, yet it took me a long time to finally get Walk in the Wild with its gorgeous moose, quail and pheasant. This is one of those wonderfully versatile sets that are perfect for masculine cards and work for many occasions (just pick your sentiment). First up, another for my In Color line up. This one is easy - I used the Deco Labels framelits to cut out my image (after it was stamped) and the Baked Brown Sugar layer that frames it. You could also cut a window in the card front and layer the stamped panel behind using Stampin' Dimensionals. This simple card can be stepped-up in many ways: add dimension, twine or other embellishments, stamp the background and/or use DSP for the background, mat, or as an accent piece. The card is Lost Lagoon cardstock, the edges of the card and the cut out layers are sponged with Baked Brown Sugar ink. The image is stamped with black ink (I used Tuxedo Black Memento) then sponged with Lost Lagoon, Hello Honey, and Mossy Meadow. Some of the edges on the stamped panel are sponged with the same ink used on the image in that area. HALLOWEEN DECOR FROM TOILET PAPER TUBES! CHECK OUT THE NEW "GIFT BOX PUNCH BOARD!"